A dental crown has many functions. It is used to protect and strengthen natural teeth that have been damaged by decay or trauma, it is used in place of a filling when a tooth requires additional support and it can also be used to anchor a dental bridge into position. Crowns are made from materials such as gold, porcelain or porcelain-fused-to-metal. It is your choice what type of crown you would like and your Broseley Dental Practice dentist will discuss the best option for you. Many patients prefer porcelain crowns as these are similar in colour to dental enamel and blend in with your natural teeth. Our dentists at Broseley Dental Practice are highly skilled at fitting crowns. 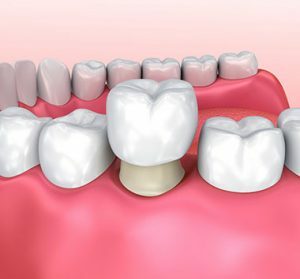 We use a strong adhesive to attach the crown to the natural tooth to ensure it feels stable and strong. The first step to fitting your crown is removing the damaged section of the natural tooth and shaping it in readiness for the crown. Once we have completed this stage, we will take impressions of your teeth so that our laboratory can build your bespoke crown. While you wait for your permanent crown, the dentist will fit the affected tooth with a temporary restoration so that you don’t feel any discomfort. At the next visit, your crown will be permanently adhered to the affected tooth.